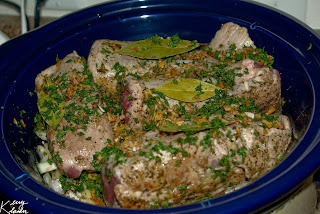 Tonight's dinner is a pork roast in the crock-pot. First prepare all the vegetables—chop the potatoes, carrots, mince up the onion, and remove the hulls from the garlic. When they’re all ready, put them in a bowl until needed. We like to put the garlic in followed by the onions, potatoes, and then carrots. Season the pork loin with the salt and pepper and rub it into the meat with your hands. Place the roast into a hot skillet that's been lightly coated with vegetable oil and pan-fry it on all sides until lightly browned. Place the other ingredients into the crock-pot in the following order: first the carrots, then the potatoes, then the onions and garlic, and finally the pork roast. In a separate bowl, mix together the water, chicken broth, wine, parsley, bay leaves, and the onion soup mix and pour the mixture evenly over the roast. Slow-cook on low for about 10 hours.